Stir egg yolk, milk and oil together gently with the dry ingredients. Fold in the egg white. Cook on waffle iron until done. Makes approximately six 3×3 inch waffles. 3 Responses to "Gluten Free Waffles"
I have recently decided to try a gluten free diet because of chronic migraines and fibromyalgia symptoms. I just started on it this past Monday and have decided to try to make waffles tomorrow. Thank you for posting this recipe. I hope the gluten free diet will be helpful!! 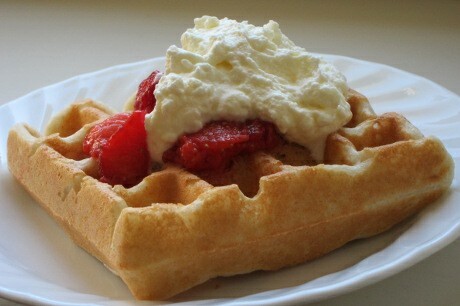 Were you able to try the waffle recipe? Lynn, I hoe it helps! I have a past of severe chronic migraines and fibromyalgia too along with a bunch of other health issues. As long as I stick to a very strict diet my symptoms really stay at bay for the most part!!! Sarah, these look so good! They are so fluffy looking in the picture. Have you ever tried to make pumpkin pancakes or waffles? I was looking for a recipe that had pumpkin in it.